Geoff has spoken to many different audiences in a variety of situations and venues. His natural modest charm and engaging manner coupled to the incredible challenges he has overcome make for compelling listening and a great source of motivation and inspiration. 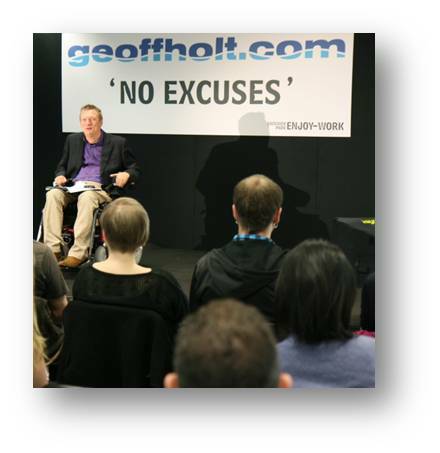 ‘Geoff Holt is one of the best motivational speakers I have seen.’ Lloyds TSB Plc. Geoff’s speaking engagements and public appearences are represented by Caroline Rose Management, to make an enquiry or to book Geoff click here.